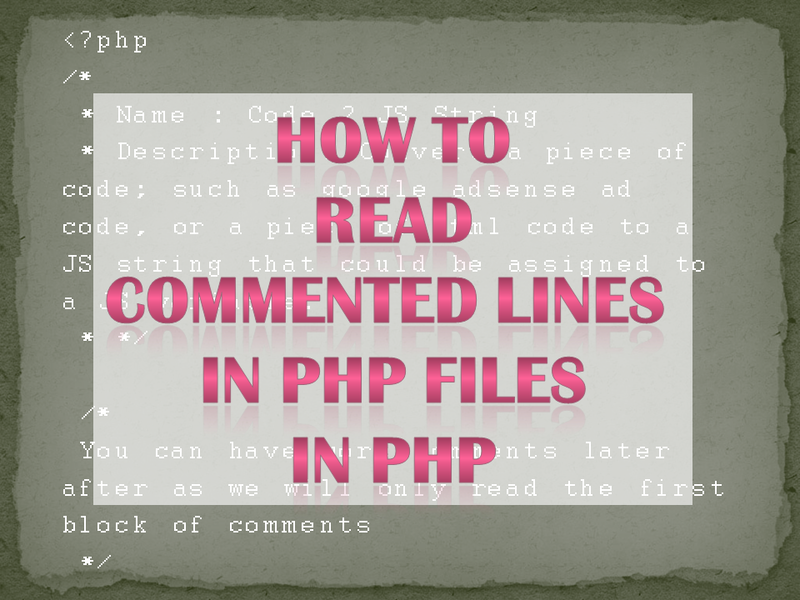 How to read commented lines in a PHP file in PHP? Did you ever noticed the commented lines over theme files, widget and plugin files in PHP in different CMS like wordpress etc.? These commented lines are not there just because the developer wanted to, these are most probably there as the system where the file will be used requires those lines to be there at the beginning of the file to describe the files in terms such as the name of the theme or plugin, created date, author name, last modified, version name etc. These information about the file then can later be used in the system or CMS. In this particular post, we will see how to achieve this purpose while writing information in comments at the beginning of a PHP file. 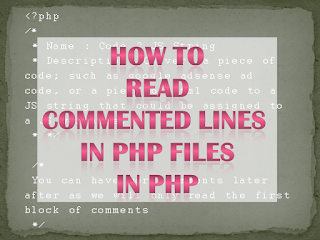 You can use 2 PHP files, one is where we will read the commented lines (index.php), another is where the commented lines of information will be (plugin.php). Though you could have done this with a single file. [description] => Convert a piece of code; such as google adsense ad code, or a piece of html code to a JS string that could be assigned to a JS variable. First of all we are reading the content of the plugin.php file in $fileContent variable using the file_get_contents() function. Then we are getting an array of tokens & contents of each token in $tokens variables. The $tokens array contains a separate array for each token it founds along with its contents. Hint: Do var_dump() or print_r() the $tokens array to examine tokens. Then we looped over the $tokens array until we find a token which is T_COMMENT. As soon as we find it, we grab the content of this token and put it in $commentBlock variable and break the loop. T_COMMENT is a constant from PHP that holds the token number for commented blocks. We are existing loop as we need the first commented block only and expect to have the information there. Then we have the $info array previously indexed with the terms of information we are seeking. This is fixed in this case. That is, no matter how much information are there in the commented block for how many terms, we will only consider the information of these terms in the $info array. In this case, the terms we will look for are name & description. Then we loop over the $info array and in each loop, we run a regular expression match on the text of the commented block using the term of the loop ($i). If found, we fill the $info[$i] with the found information. No dynamic terms will be fetched. However, to have additional information to be fetched, just add the term in the $info array, no need to code.